Art mysteries have proliferated in recent years, mostly with stories centered around stolen art, forgeries, and/or murdered artists, art collectors, and the like. It is considerably more difficult to construct a mystery around architecture than around art, as it’s not easy to forge or steal a building. Most series only last for three or four books, while many are one-offs. Donald E. Westlake does, however, manage to steal a building in Castle in the Air (1980). This amusing caper brings together a group of European thieves and con artists under the direction of “master criminal” Eustace Dench. He has agreed to help Lida Perez, a beautiful rebel from the South American country of Yerbadoro, in repatriating a fortune stolen by the president, with a 50/50 split. The soon-to-be-overthrown president is attempting to smuggle his ill-gotten gains out of the country by hiding them in the stones constituting a Yerbadorean castle that is on its way to Paris as part of an international exposition. Adding to the usual crosses and double-crosses frequently encountered in capers are language barriers (there is no common language among the Brits, French, Italians, etc. ), the eccentricities of the characters (one was unwillingly broken out of his Italian jail), jockeying for Lida’s attention, and the overall absurdity of the project. This is a delightful twist on the genre. Keith Miles, perhaps better known as Edward Marston, is the author of two architectural series. Under his own name he wrote the two Merlin Richards books, Murder in Perspective (1997) and Saints Rest (1999). In these stories Richards is a promising young Welsh architect who decides to come to the US to meet his idol, Frank Lloyd Wright. In the first book Richards meets FLW at Arizona’s Biltmore Hotel in 1928, where he is consulting on its design and construction. One of the distinctive concrete blocks used in the construction is the murder weapon. Three years later Richards is in Saint’s Rest, another name for FLW’s Oak Park, Illinois; this time Richards has a commission to design a mansion for a meat tycoon who soon ends up dead in his new home. The Christopher Redmayne series is published under his nom de plume. Thus far there are four titles: The King’s Evil (1999), The Amorous Nightingale (2000), The Repentant Rake (2001), and The Frost Fair (2002). UK readers will likely have better luck in finding the first three books, as only the last has received much distribution in the US. Redmayne is a young architect in 17th century London, looking to make his name out of the ashes of the Great Fire of 1666. In each story Redmayne has received a commission to build a house, but at least one murder interferes with its completion. In the first novel he meets Jonathan Bale, a Puritan constable, and the two join forces to solve the various crimes. The now-deposed Puritans believe the Great Fire was revenge for the Restoration, and the conflict between the Cavaliers, as personified by Redmayne, and the Puritans, represented by Bale, underlies each of the tales. Delightful comments about London architecture, rebuilding the city, and the practice of architecture, abound in this architectural mystery series. A fifth book, The Parliament House, is in progress. The “Home Repair Is Homicide” series by Sarah Graves features Jacobia “Jake” Triptree, a former high-powered NY financial advisor who gave it all up by moving to small-town Maine and buying an 1823 Federal-era house in need of considerable restoration. Dead Cat Bounce (1998) is first in the series, which introduces Jake, her son and ex-husband, her new best friend in town, Ellie, and their assorted problems and issues. As Jake and Ellie are working on the house, they discover a body in a storeroom. In Mallets Aforethought (2004) Jake and a very pregnant Ellie are working with the local historical society on restoring the town’s most infamous landmark, the early 20th century Harlequin House, when they discover two bodies behind a secret door. The books all include considerable detail about restoring old houses, as well as discussion of the merits of various architectural styles, but Dead Cat Bounce and Mallets Aforethought are more focused on architecture. This is a well-written, interesting series, despite its unfortunate name. The author herself lives in a similar house in Maine, and is intimately familiar with restoring a historic home. Jill Churchill’s The House of Seven Mabels (2002) also has home restoration and redecoration as its central theme, with some interesting details, but overall the story is does not have much of an architectural focus. It is the 13th in Churchill’s Jane Jeffrey series. Denise Osborne writes mysteries involving feng shui practitioner Salome Waterhouse, who solves the crimes by studying the residences of villains and victims. Osborne comes across as more intent in promulgating feng shui than in writing a good story. A Deadly Arrangement (2001), Positioned To Die (2002), Designed To Kill (2003); due later this year is Evil Intentions. One of the most interesting books with an architectural theme is James Bradberry’s The Seventh Sacrament (1994). In this first of three books featuring Princeton architecture professor Jamie Ramsgill, he has been hired by the richest man in Italy to oversee an architectural competition. Six world-renowned architects have been invited to compete for a $5,000,000 commission to design what they think will be the world headquarters of an Italian company, as well as an original manuscript of Vitruvius’ De Architectura. The setting itself, a northern Italian Renaissance villa, is an architectural marvel, and each architect is provided with his/her own spectacular pavilion. But then one of the competitors dies, followed shortly by a second. Who is killing off the world’s great architects, and why? Fashionable architects and architecture are effectively parodied, with wonderful details and commentary. Ruins of Civility (1996) has Jamie visiting his former mentor, Rainer Grass, at Cambridge University. There are plenty of suspects when Grass disappears after announcing he won’t be retiring after all, including an author about to publish a book on architectural ruins. Eakin’s Mistress (1997) is more concerned with art than architecture, specifically a previously unknown painting by Thomas Eakins of which there is also a forgery. Jamie intends to give up teaching for private practice, but before he can start, the firm’s principal disappears with $75,000. Both paintings are linked to the architect’s disappearance, and Jamie is under suspicion for a brutal murder which he must solve to clear himself. Brian Johnston is the author of four mysteries featuring young architectural historian Winston Wyc, all of which take place in New York’s historic Hudson River Valley. In The Good Luck Murders (1991) Winston has arrived in the village of Wistfield to work on the restoration of an early 19th century mansion, his first job. Most of the villagers are participating in the weekly activity of beagling (similar to fox hunting, but they walk instead of ride, and the hounds chase after a hare). He and the local doctor, Janice Wetmore, soon come across the body of one of the hunters stabbed in a cornfield, with a rabbit’s foot charm in his mouth. The previous year two elderly ladies were also found dead with a rabbit’s foot, and the three victims were all members of a hunt club committee in the 1950s. But what could be the motive for their deaths 40 years later? The mansion is a key part of the mystery, and there are numerous fascinating details about the complexities of historic restoration sprinkled throughout. In The Dutch Treat Murders (1991), a religious order provides weekend retreats at Smelton Castle, their home on the Hudson. However, the board of trustees is divided on the Castle’s future—should it be sold for its valuable land, or declared a historic structure? Winston is hired as a consultant by the pro-historic faction, and soon the body of one of pro-sale board members is found floating in the river. After local terror Minerva Trotteville is trampled by her own horse, Janice Wetmore persuades Winston to return to Wistfield to consult on the restoration of Minerva’s home in The Gift Horse Murders (1992). Before long, he finds the body of the president of the society in charge of the restoration. He and Janice again work together to solve the murders. With Mallets Aforethought (1995) is the final book. Retired millionaire Clement Corbally, Sr. is acquiring buildings in preparation for creating an 1870s historic site à la Old Sturbridge Village (Massachusetts), but his partner and sons have other ideas. Hoping to ruin the plan entirely, son Sackett hires Winston to convince the wealthy patriarch of the folly of his project. Winston finds himself both charmed and impressed by the detailed plans, but Clement is murdered at a garden party before the project can proceed. Late 19th-century American architecture is a central element to the story, and line drawings of various architectural details accompany the text. Roy Lewis has written numerous mysteries featuring Northumberland-based Arnold Landon, amateur medieval historian/archaeologist/architectural enthusiast. All of Arnold’s cases involve British historical sites, with architecture taking a varying role in the stories. In A Gathering of Ghosts (1982), first in the series, mild-mannered Arnold is a planning officer who attempts to save a medieval barn from demolition to make way for an amusement park. Third in the series, A Trout in the Milk (1986), has substantial details about English country houses, Norman castles, and Roman architecture as Arnold tries to help two women save their farm from unscrupulous developers. This is followed by Men of Subtle Craft (1987), in which Arnold is asked to help trace a 12th century master builder; a ruined castle is integral to the plot. In A Wisp of Smoke (1992), Arnold is researching medieval architecture for a book when the author is murdered and Arnold himself begins receiving death threats. By the 7th book, A Secret Dying (1992), Arnold has a new job with the Northumberland Dept. of Museums and Antiquities where he is immediately assigned to research British architecture for a new brochure; his predecessor has disappeared shortly after inspecting several medieval-era buildings. The subsequent Arnold Landon books focus more on archaeology than architecture. His latest is Headhunter (2004). In addition to mysteries about architecture, there are a few sub-genres, such as interior decorating and architectural photography. Among these are Joyce Christmas’ Mourning Gloria (1996), which takes place in a New York designer showcase house; Death by Inferior Design (2004) by Leslie Caine has her decorator participating in a competition; Dean James’ Decorated to Death (2004) features a gay American vampire investigating the murder of an English decorator/TV personality who specializes in room makeovers, while Murder by Design (2004) by Jon P. Bloch has a gay TV entertainment/gossip reporter participating in a room makeover. Emily & Henry Bryce are interior decorators in a five-volume series (1948-1963) by Margaret Louise Scherf. Medora Sale is the author of five books featuring Harriet Jeffries, an architectural photographer (1989-1994), although only the first, Murder in Focus, (1989) has much to do with architecture. Thus far two of Kate Ellis’ books have a major architectural component. DS Wesley Peterson is originally from the West Indies, now working in Devon, and holds a degree in archaeology. In The Skeleton Room (2003) he is called upon to investigate a skeleton found in a bricked-up room in an 18th century mansion, while in The Bone Garden (2001) two skeletons from the early 18th century are found during the restoration of a 17th century estate. There are also several one-offs, among them Marjorie Eccles’ Cast a Cold Eye (1988). In this first Gil Mayo mystery, DCI Mayo investigates the death of an architect in his country home outside Birmingham, England, the day after he hosted a party to celebrate his prize-winning design of a Norwegian health center. In The Witchfinder (1998), a dying world-famous architect commissions Detroit PI Amos Walker to uncover just who framed his fiancée many years before by faking an incriminating photograph. This is the 12th in Loren Estleman’s long-running series. Edinburgh DI John Rebus has been assigned as liaison to Queensbury House, which is being restored as the home of the new Scottish Parliament. However, during the restoration a 20-year-old dead body has just been discovered in a newly-uncovered fireplace where, legend has it, a young man was roasted on a spit by a madman. Such is the background for Set in Darkness (2000), the 11th in this series by Ian Rankin. Rochelle Krich’s Dream House (2003) is the 2nd in her Molly Blume series. L.A. crime reporter Molly investigates the vandalism of several homes in wealthy Hancock Park, where neighbors have drawn up sides in a very nasty historic neighborhood preservation dispute. But when one of the homes is burned, killing an elderly man, the dispute takes on a more somber character. 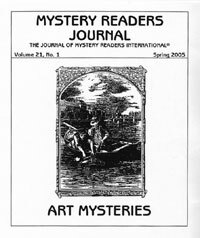 In the just-published The Devil’s Wind (2005) by Richard Rayner, noted L.A. architect Maurice Valentine is happily getting commissions in 1950s Las Vegas, for both casinos and ersatz suburban subdivisions intended for destruction by monthly atomic testing, under the patronage of a powerful mobster. Then he meets heiress Mallory Walker, who claims to be interested in architecture. But at a ritzy Vegas party where the main attraction is viewing the detonation of an a-bomb, Mallory unexpectedly pulls a gun and fires a shot at him; shortly thereafter she is killed in a car accident. The early years of Vegas are a fitting milieu for this historical noir. Finally, Pat McIntosh takes the reader back to 15th century Glasgow in Harper’s Quine (2004). The city’s cathedral is still under construction in 1492 when the body of a murdered woman is found in the chantry chapel. She is soon identified as the runaway wife of a local nobleman, and Maistre Pierre, a French master mason, joins with recently-qualified lawyer Gil Cunningham to solve the crime. Then a second murder occurs, leading the pair to the nearby Isle of Bute. A second mystery featuring Maistre Pierre and Gil Cunningham is scheduled for publication in the UK later this year. McIntosh is already being mentioned as someone who will do for Glasgow in the 15th century what Ellis Peters and her Brother Cadfael mysteries did for Shrewsbury in the 12th. Because my mystery series uses quilt titles as metaphors for the stories, people always ask me if I am a quilter. Though I have made five or six very simple quilts in my life (and have threatened the recipients of these quilts with a protracted and painful death if they show them to anyone), I do not consider myself a quilter. I have too much respect for the title and know so many women who deserve to be called both quilter and artist. I prefer to label myself a quilt appreciator, someone who both admires quilts and those who create them. To be honest, I had no idea when I started my Benni Harper series in 1992 that there were an estimated twenty millions quilters in the United States. I simply wrote about quilts because I love them. When I made those sincere, but amateurish quilts almost thirty years ago, I found myself becoming more interested in the lives of the quilters I read about than the actual process and techniques of quilt making. What was happening to each woman (most quilters are women, though there are a few male quilters) while she made her quilt, what the quilt represented, what she was feeling and who the quilt was for, became the information I sought. I started buying quilt books that told the history of quilts and quilters rather than techniques. At this same time, I was taking a creative writing class at a local community college. It never occurred to me as I was writing short stories, many inspired by my mother’s Arkansas background, that quilts would someday work their way into my writing. When I started my first novel I was thirty-seven years old. I put a quilt show in it because I’d given my main character, Benni Harper, the job I would have loved to have had—curator of a folk art museum. Folk art or “outsider art” as it’s often called today, is the art of people not trained or educated in a conventional manner, that is, college and art school. It is art truly born of the heart and the soul. Its natural beauty and creativity is so admired among artists today, there are even some who were actually college educated in the arts and chose to pose as outsider artists trying to cash in on the phenomenon. I guess I relate to true outsider artists because I’ve never gone to college myself and have taken only a few classes in writing at community colleges. Like the outsider artists, I think I taught myself how to write. What I actually did was write the book I wanted to read—put all the things in it I love, folk art, down-to-earth rural people, the Hispanic culture I grew up in while living in La Puente, the Central Coast of California, where I wish I could live. I just plain had fun writing that book. I was at a quilt show when I came up with the idea as quilt patterns for my titles. I was reading the biographies of the quilters (as much fun for me as looking at the quilts) and marveling at the evocative names for the quilts. It occurred to me to name my book after a quilt pattern—Drunkard’s Path. It was a great metaphor for the plot which dealt with drunk driving and its consequences. After a teacher at a novel writing class at another local community college offered to send my book to her agent in New York (an incredibly lucky break for me, not of my own doing as I didn’t know a thing about publishing) she asked me to put in the query letter an idea for a series. Since I hadn’t been thinking about writing a series when I wrote the book (later to be called Fool’s Puzzle) I was stymied, until I saw a book I owned, “The Encyclopedia of Quilt Patterns” by Barbara Brackman. There were 4000 quilt patterns in there, every one of them sounding like a potential story. I suggested quilt patterns and my series was sold in less than three weeks—a lead title for Berkley Prime Crime’s new hardback mystery series. Though it appeared I was an overnight success, I’d actually been writing ten years with 150 unpublished (and deservedly so) short stories to my name. It was when I went back to my roots, to the quilts I loved as a child and the quilters I admired as an adult, that my writing came together and became my own. Earlene Fowler‘s latest Benni Harper mystery is Delectable Mountains, to be published in May 2005. Six of her books have been nominated for Agatha Awards. Her sixth, Mariner’s Compass, won the Agatha for Best Novel of 1999. She lives in Southern California with her husband, Allen, and her tri-colored corgi, Boudin. Gioanna is a barista in Rome, a very good one too. Which means, as the Italian speakers among you will realise, she serves an excellent cup of coffee and a mean panino too, with a running commentary on the state of the world in between bouts at the Gaggia machine. She is also, like most of her kindred citizens, extremely nosy. So it was that, a year or so after I decided her cups of macchiato and fresh cornetti were the best in my neighbourhood, I got the “you’re not leaving here until I find out why exactly you’re in Rome” conversation. For once—Gioanna isn’t the sort to be messed with—I didn’t make up something about being “in publishing.” I told her I used to be a journalist who came to Rome on assignment. Then, when I turned to fiction I decided to set a series of stories in the city, hooked around a local detective called Nic Costa who is somewhat untypical: young, a little naïve, good-natured and desperate to do his best at a job he finds extraordinarily difficult at times. And there you have Romans to a tee. This conversation was taking place in a small café in the centro storico, the historic centre which, just to confuse matters (this is Italy), doesn’t include the historic bits most newcomers tend to think of first, such as the Colosseum, the Forum and the Palatine Hill. From the front door of Gioanna’s little café I could, in a matter of minutes, be standing outside the front door of the mistress of the infamous Borgia pope, Alexander VI, mother to the equally infamous Cesare and Lucrezia, and now home, on the ground floor, to a rather wonderful cake shop. The Pantheon, a pagan temple erected by the emperor Hadrian, continues to stand in the same square where it was built almost two millennia ago, topped by what was the largest unsupported dome in the world until the 20th century. Around the corner you can still make out the shape of Pompey’s theatre in the Renaissance buildings that followed it. Caesar was assassinated here, and the place of his funeral pyre, and Mark Antony’s famous oration, is, of course, marked out in the Forum just a short distance away. The underground remains of Nero’s colossal palace, the Domus Aurea, or Golden House, are just across the road from there. Up the hill is the church where a set of chains on the altar were supposed to have been those which imprisoned St. Peter before his martyrdom. The cell where he was reportedly imprisoned is still there, in the basement of the horrible white wedding cake state building that stands at the end of the Forum, in the Piazza Venezia. Artists and writers—from Caravaggio to Michelangelo, Virgil to Goethe—have walked these cobblestones for twenty centuries. The question I ask myself isn’t: why here? It’s why on earth am I the lone traveller on this particular path? Venice has been the fictional site for countless tales, including my own one-off novel Lucifer’s Shadow. But I am a lone wanderer in Rome as far as foreign writers are concerned. Lucky me! Rome suited my purposes for several reasons. When I set out to create my first stab at a series—all my previous novels had been one-off works—I was determined to lay out a framework that would, I hoped, help me avoid the third or fourth book fatigue that can so easily dog episodic stories. So I wanted an urban location, and one with a vibrant international community, where my characters would meet plenty of people who were strangers in a strange land. I wanted to look at a familiar city too, and Rome met that qualification many times over. I don’t care if you’ve never set foot in Italy, you’ve all, in a way, been to Rome. This is a place that’s shaped our language and the way we think. The words we use, the calendar, the legal system, our notions of justice and how governments should be run… all of these things come down to us, for the most part, from the society that lived here 2,000 years ago. Ancient Rome was, remember, a huge metropolis, more than a million people, from all over what was then the known world. There was nothing primitive about their culture whatsoever. It embraced art and poetry, political machinations and the thorny, never-ending problems of trying to run a large, over-stretched empire. Get to know that gossipy Roman historian Suetonius—and I advise you strongly to get a copy of his The Twelve Caesars, because it’s a great read—and you soon realise just how close that distant world is to ours of today. Lots of the big questions we face—what do you do about foreign dictators who might one day be a threat? How you deal with alien cultures, by absorbing them or suppressing them?—were hot topics for the Romans too. A lot of my work revolves around a simple background dilemma too—why do human beings constantly refuse to learn from the mistakes of their predecessors? Rome’s the perfect place to set stories where that issue runs beneath the surface. Nuance and context, the detritus of all those past lives, large and small, lurk down every little alley. It’s a gift a writer like me can’t ignore. Finally, there’s the question of people. As anyone who gets to know the country well understands, there’s no such thing as “the Italians.” Italy, as a country, is a creation of the 19th century. Between the fall of the Roman empire and the creation of today’s modern state lies a complex morass of history encompassing popes, foreign invaders, native warlords and a stack of conflicting cultures. There’s a touch of truth in both. I’m a northerner too so my Roman friends baffle me from time to time. When northern types see a problem, they look for a solution. In Rome, you go out and buy a new pair of shoes, and feel a whole lot better for it. The Romans have a Mediterranean attitude towards life you’ll find everywhere along the shoreline of that fascinating sea. They’re interested in what happens to them day to day, not tomorrow or ten years hence. People are more important than possessions (shoes and clothing in general being, perhaps, close to an exception to this rule). A good meal with your friends or family in a bad restaurant is far more preferable to a wonderful culinary experience shared with someone you find a touch boring. The quality of the moment is what counts, and they judge that with an alarming and rapid frankness. What does this give me as an author? Characters who are, I hope, a little outside the norm. Nic Costa is the son of a Communist politician and, while apolitical in his own eyes, has absolutely no patience with the idea that it’s best to cut and trim your approach to life in order to meet the approval of those around you. He’s a good man—though not always a good cop, because police work is, anyone familiar with it in the real world, one that is, of necessity, littered with mistakes. And he finds himself in a world where goodness comes second to practicality, the world of realpolitik, compromises and secret deals, that is commonplace today, and not just in Italy either. The question Nic Costa faces every day he goes to work is: what does it mean to be a good man in a society that’s becoming increasingly less interested in values and more obsessed with possessions and money with each passing day? The fact he’s an educated Roman, knowledgeable about the past of his native city, makes it all the more awkward for him too. Nic is, in short, an awkward, unfinished, optimistic and hopefully rather likeable individual of the kind you want to bat around the head with a newspaper from time to time, yelling: Get real! He’s also a million miles away from the smart, highly efficient, gun-toting, babe-pulling super-cops you’ll find elsewhere, but they’re not really my scene, so if they’re yours, be warned. My stories are set in the Rome I know, a place full of rich, occasionally shocking textures, one that manages to be both ugly and beautiful, cultured and brutal, at the same time. A city that, ultimately, is much like life itself, and life, lest we forget, is ultimately the subject of every book worth reading. David Hewson is a former arts correspondent of the London Times and continues to write a weekly opinion column for the Sunday Times. His first novel, Semana Santa, set in Spain during Holy Week, appeared in 1996 and was later filmed with Mira Sorvino. His mystery series set in Rome, featuring Nic Costa, began with A Season for the Dead. Random House have bought the next five books in the series, four of which are now written, for annual publication. The author’s website is www.davidhewson.com.